Big Sky Water Park is the largest water park in Montana, and a welcome relief to countless visitors during the summer heat. There are plenty of awesome rides and activities to entertain the whole family. It is a great place to spend the day lounging in the sunshine and zooming down a long waterslide. The park has a number of very popular rides. The Big Shredder is a slide that allows single, double, and triple tube riders, and the Big Splash River Ride gives you the feeling of riding the rapids. For the thrill-seekers out there, you can climb to the top of the 7-story Pizza Hut Geronimo Speed Slide, and take the plunge, or brave the Roller Coaster Bullet Speed Slide. After having a whirl down some of the slides, you can go in battle in a water balloon war with your friends and family, or have a round of miniature golf. Take an awesome ride on the bumper cars, or a go-round on the carousel. There is even a full arcade having all the latest titles in case you want to take a short break from all of the watery action. 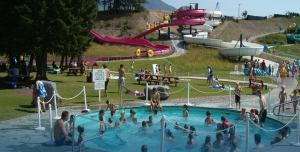 There are plenty to do at the Big Sky Water Park. Other Specials & Coupons To view Big Sky Water Park Admission Tickets, other Specials and Coupons, go to their special page by clicking here. Big Sky Water Park updates this page throughout the year, so check back to see if new specials and coupons have come in. Note to our visitors Big Sky Water Park coupons and specials can change without notice. So please visit their official website to make sure of the latest pricing and coupons.